Prosource Plus is formulated to provide the nutrients necessary for the dietary management of protein-energy malnutrition and protein deficiency. Oral: Use ProSource Plus Liquid Protein as a med pass directly from the bottle (or packet) or add it to all types of beverages, soups, hot and cold foods, and purees. Saves nursing time, storage space, waste and kitchen labor. Unlike powdered protein supplements, it mixes easily into all liquids and moist foods. Tube: Ideal for both open- and closed-tube feeding systems. Will not clog feeding tubes. Mix with 30 mL water. Stir until completely dissolved. Infuse via syringe down feeding tube. Flush tube with 15–30 mL water before and after administration. Ingredients: Protein from Collagen Hydrolysate and Whey Isolate, Purified Water, Sucrose, Natural Flavors, Citric Acid, Malic Acid, Phosphoric Acid, L-Tryptophan, Potassium Sorbate and Sodium Benzoate (preservatives), Red 40. Contains milk. Case Size: 4/30 fl oz. Do not refrigerate. Discard three months after opening. 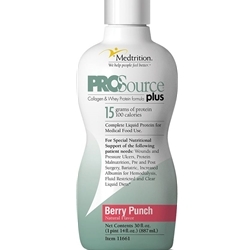 Prosource™ Plus, Berry Punch - 1/30 fl.oz. Prosource™ Plus, Berry Punch - 4/30 fl.oz.